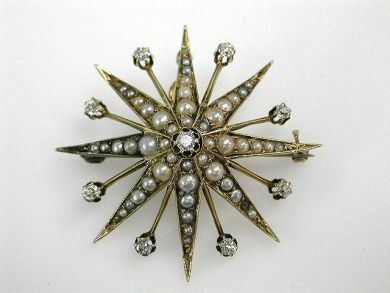 One 14 karat yellow gold starburst Victorian brooch. One round brilliant cut diamond (0.07 carats: VS1 clarity: H colour). Eight old European cut diamonds (0.43 carats: SI-I1 clarity: H-I colour). Forty-eight seed pearls.